Chris (elder son) and I took a 172 out to Goochland County to have a look at a private airfield whose owner, I've heard, lets a few other people base their airplanes there. It's a grass strip, quite long, with a long open space at each end and a lake beside it. Looked lovely from the air. 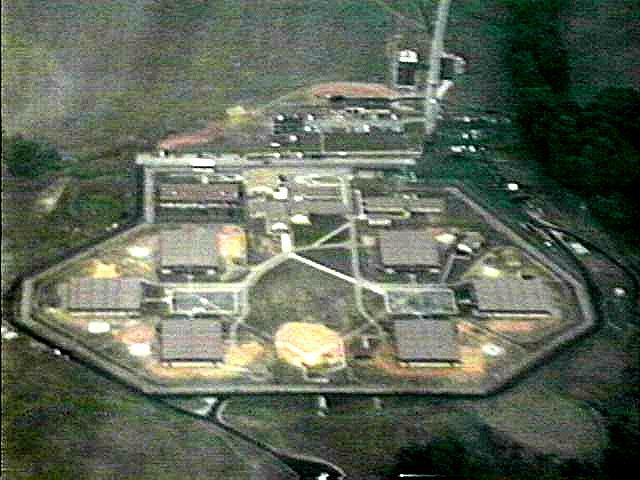 Then we flew a few miles farther west to the prison where my Carol (wife) teaches. (It's the "prison" on the James River west of Richmond on the Washington sectional, an ugly spot in otherwise beautiful farmland.) We circled it a couple of times--keeping our distance and altitude because the guards are armed--and tried photographing the place. I guess it's okay to post this one, blurry image that I grabbed from an 8mm video. After all, there are satellite photos already available on the web. This is the low- or medium-security part of the larger prison complex. The maximum-security area, about a mile away from this part, has even heavier fencing, a lot more barbed wire, and imposing guard towers. When I taught some college classes there, about 20 years ago, I found that the inmates were among the brightest students I'd had anywhere. But it was odd: I could never get my car to go more than 40 on the way to class, but on the way home I couldn't keep it below 70. The visibility wasn't too good today--about 8 miles, or so, of Central Virginia haze--so the colors were rather washed out, even though there was a sky filter on the camera. I pushed up the contrast and brightness a bit to get this frame. There's not much detail--you can barely pick out cars in the parking lots near the top of the frame. We were at 2,500 feet AGL and about a mile away, so I think it's due to the low resolution of the camcorder. The mottled areas are mostly reflections on the window.